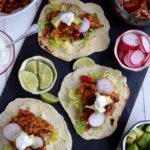 This post has been sponsored by Seeds of Change® Organic Simmer Sauces. All opinions expressed are my own. 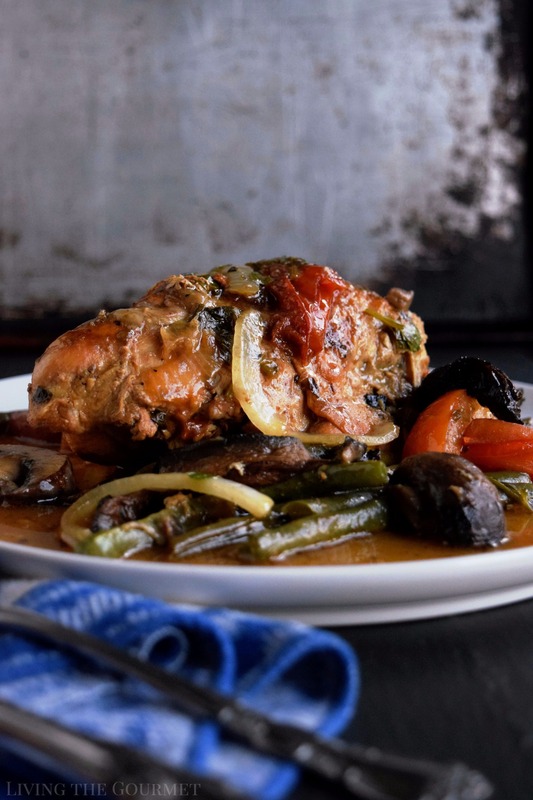 Nothing soothes the soul like chicken stew, and this simple stovetop recipe will become a seasonal staple in your home. Thanks to the new Seeds of Change Simmering Sauces, gourmet-style family dinners are only a few ingredients away! However, as with all sources of pleasure, the concept of ‘conscience’ is brought into the discussion. In this case, the idea of sustainability, fair trade, and whether or not we’re indulging in ‘natural’ ways are all points of interest when it comes to food – and understandably so. 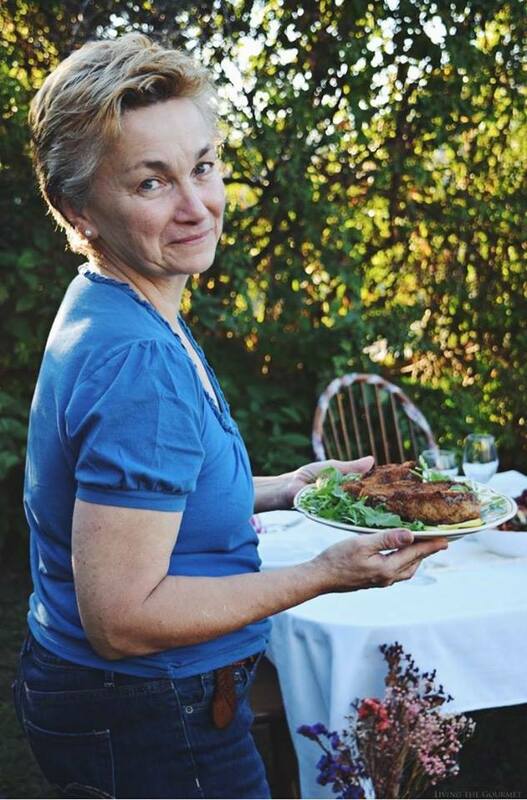 That said, when I was introduced to Seeds of Change Sauces, which combine sustainability, delicious flavor, and organic ingredients into compact, reasonably priced packets, my professional curiosity was piqued. To this point, Seeds of Change uses only organic ingredients, while donating one percent of their sales to promote and support sustainable community farming and gardening programs. Readily available at Target, along with a host of other retailers, I picked up a few pouches on my last supply and decided to put them to the test. 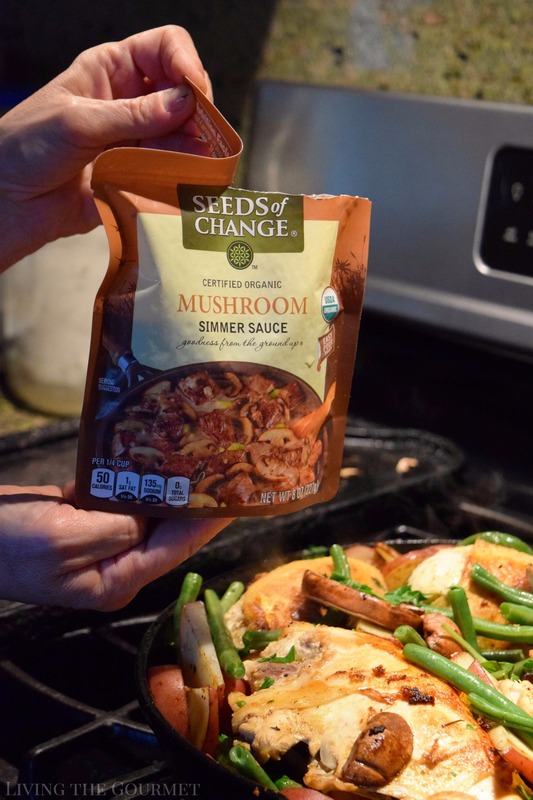 To do this, we, of course, come to today’s recipe – Oven Top Chicken Breast Stew, prepared using Seeds of Change® Mushroom Simmer Sauce. 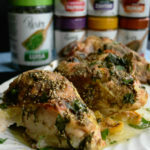 To start things off, we begin by combining the rub as directed below with some coriander, black pepper, nutmeg, lemon juice, and olive oil, and the rubbing it over the chicken breasts. Once done, we set the chicken aside, and heat a large cast iron frying pan with olive oil, and then set the chicken breasts in the pan skin side down to achieve a nice golden coloration on the skin, turning them over once during the process. This takes about ten minutes. Leave the breasts skin side up once this is done. 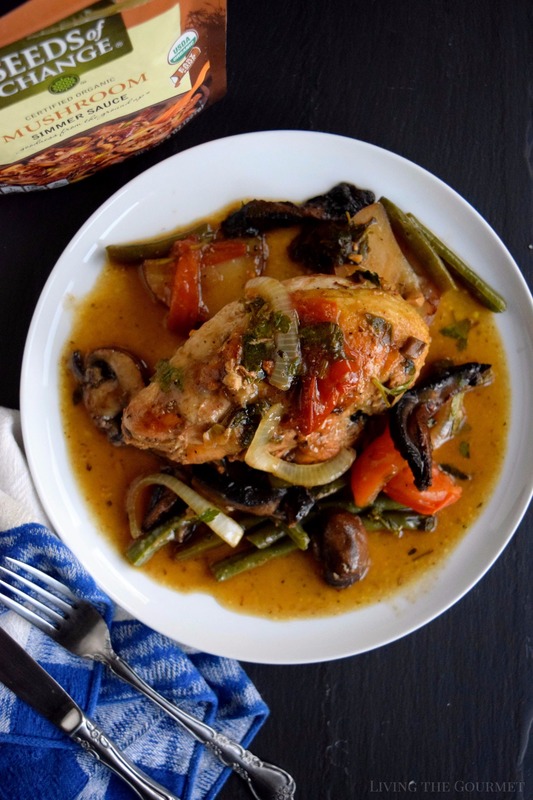 After that, we add in chopped fresh garlic, fresh basil leaves, sliced tomatoes, and parsley to the pan with the chicken, and allow that to continue simmering on low while we par-boil the string beans and potatoes as directed below. 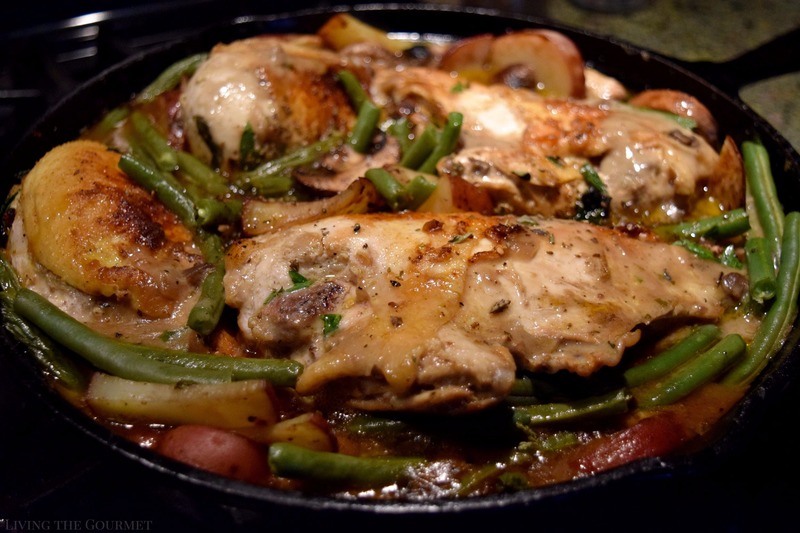 Next up, you’re going to need to heat a large cast iron griddle or frying pan with some olive oil, and then lay out the sliced potatoes, string beans, and sliced mushrooms to give them all nice golden coloration, and then add them into the pan with the chicken breasts. Once that’s done, add in some bay leaves, dried oregano, and the Seeds of Change Mushroom Simmer Sauce to the pan with the chicken. 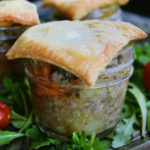 The Mushroom Simmer Sauce is prepared using organic mushrooms, onions, spices, and a hint of cream, and is certified free of artificial colors, preservatives, or flavorings, making it perfect for a natural recipe such as this. After you’ve done that, let the stew continue to simmer for about ninety minutes, and then you’re ready to serve. Combine the coriander, black pepper, salt, nutmeg, lemon juice and olive oil in a small bowl and stir. Rub the chicken down with this mixture. Heat a large cast iron frying pan with 2 tbs. olive oil and place the chicken breasts skin side down to give them a beautiful golden color; turning them over once. This will take about 10 minutes or so on each side. Leave the skin side up when you are finished grilling them. Add the garlic, fresh basil, parsley and tomatoes and continue to simmer on low. Parboil the string beans and potato. Slice the potato. Heat a griddle or large cast iron frying pan with a tablespoon of olive oil and place the sliced potato, string beans and sliced mushrooms to give a little golden color to them and add to the pan. Add the bay leaves and dried oregano to the pan and continue to simmer on low. Add the mushroom simmer sauce and continue to simmer on low. Cover the pan and let cook for about an hour and a half or so. 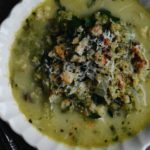 Serve with fresh grated Parmesan or Romano cheese. It looks like a perfect meal! The chicken pieces look so nicely golden, juicy and flavourful. oh yes this certainly is a soul soothing stew and such a great stew for the cooler days we are starting to have. This sounds likes it's perfect for a working family on a weeknight. Days get so busy and yet a nice well rounded meal like this can make it so much more pleasant. That sauce sounds fantastic - I bet it has so much flavour! What an easy way to amp up a simple stew. Delicious looking recipe this is proper comfort food! What a hearty, comforting meal!! 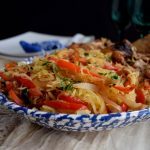 I need to add this to our dinner menu rotation! I make a chicken stew that we enjoy during the winter time, but it's nothing like this. That mushroom simmer sauce sounds amazing! What a great base for a stew. I had no idea that Seed of Change has sauces too! 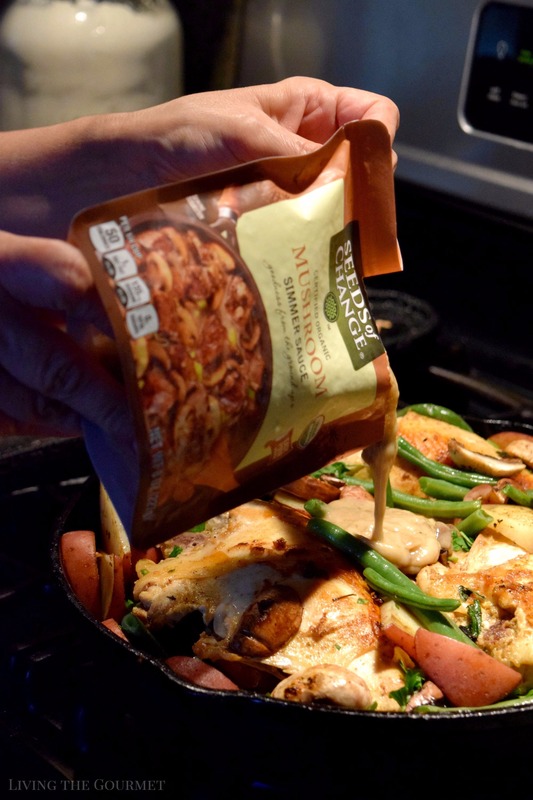 This looks like a great one-pan meal! Mushrooms are the absolute best! This is such a perfect dinner food. Thanks for the recipe! That looks like a filling and hearty meal..I have never made a stew this way, the recipe sounds very interesting. The sauce sounds wonderful and I can definitely use this in some of my vegetarian stews. Need to check out on the Seeds of change products. Love stove top recipes as it is less work and less cleanup. The stew looks very delicious and would warm us up on a cold night. Oh yum, this screams Sunday dinner to me!! The addition of that sauce makes me think it would have cooked for hours to get that flavor, and I really love that you played off it with the addition of all those mushrooms...yum! Thank you for introducing me to the sauce. Great meal starters, for sure. This recipe looks so...I want to say comforting, but it is more than that. The colors and your photography make it jump off of the screen. I love it. Nothing like a quick simple semi homemade meal. I love mushrooms sauce. This would be perfect for my busy day evenings. 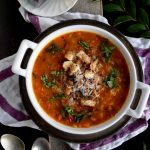 Looks like a comfort food for winter too! Catherine, this simmer sauce sounds delicious great meal is ready with few step of work. I like that part as week nights are biggest hassele for me. Love your recipe. My daughter always said "home is where the chicken is" because we ate so much of it. But, truth be told, we love it. I'm always looking for new ways to prep the meal and yet use standard ingredients. I'll be on the look out for this magic ingredient! 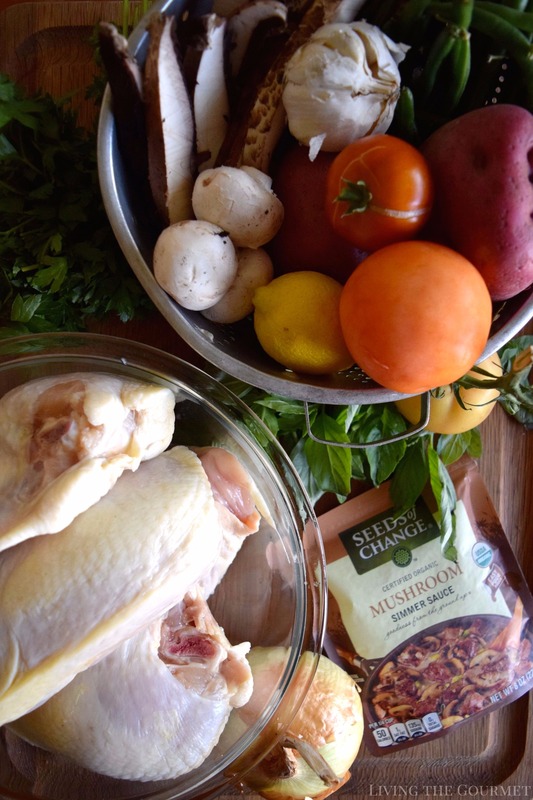 This chicken stew is so perfect for the upcoming cooler temps and fall season! It looks delicious. I think my family would especially love it! Can't wait to try it out! 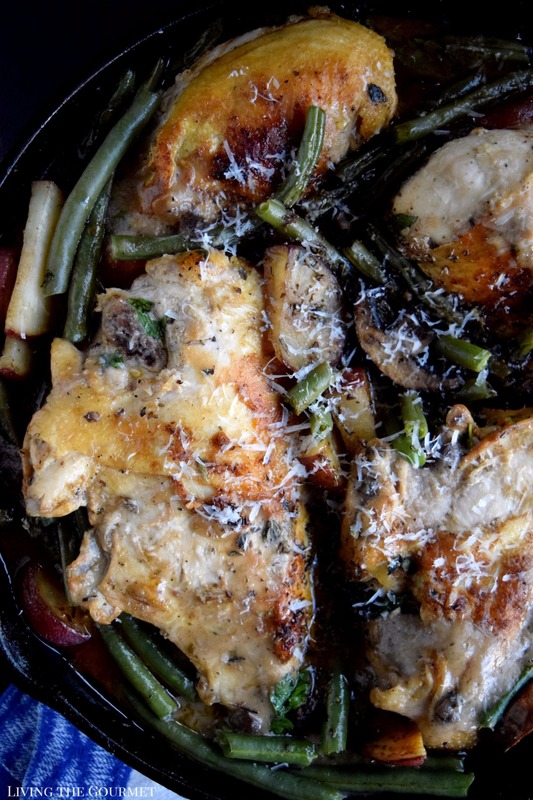 This is such a hearty fall dish! I love the ease of using a sauce packet, especially one with solid ingredients.